Sunline's newest edition to their lineup is the FX2 Frogging & Flipping braid. With pro fisherman, Dean Rojas, in mind they set out to create a braid specifically for frog fishing and flipping. This line is produced with an eight strand braid with circular cross section and a smooth surface. It comes in a moss green color and has excellent abrasion resistance. 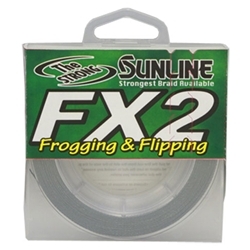 Sunline's newest edition to their lineup is the FX2 Frogging & Flipping braid. With pro fisherman, Dean Rojas, in mind they set out to create a braid specifically for frog fishing and flipping. This line is produced with an eight strand braid with circular cross section with a smooth surface. It comes in a moss green color and has excellent abrasion resistance.